You want your users to fill out a form on your app and you’d like to have certain fields pre-populated for them. 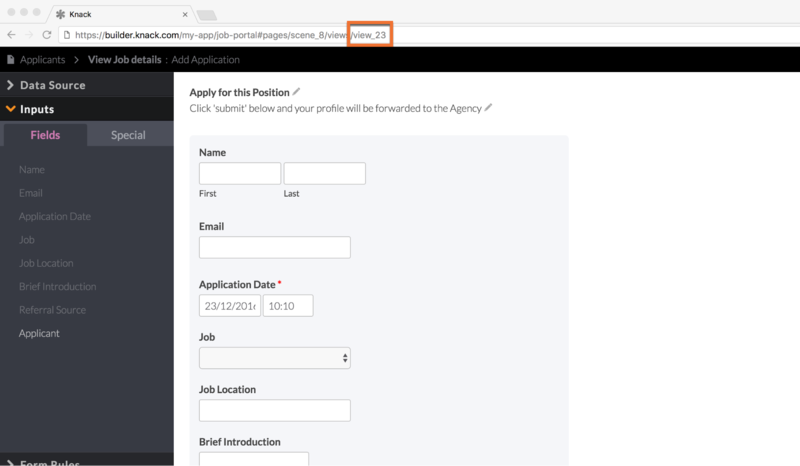 Example: You’re posting the link to a job application form on your website and you’d like the Job, Job Location, and Referral Source to be pre-populated for all applicants. An existing add record form that you want pre-populated. In this example, it’s the “Add Application” form. This feature does not work to modify values on an edit record forum. The fields that you want to pre-populate must be included on the form. Fields that aren't on the form can't be pre-populated for security reasons. 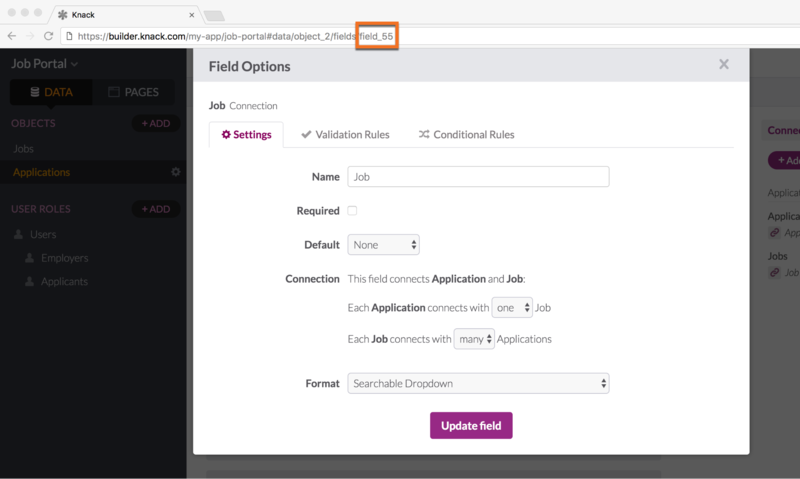 Decide which fields you want to pre-populate and what value you want each field to have. 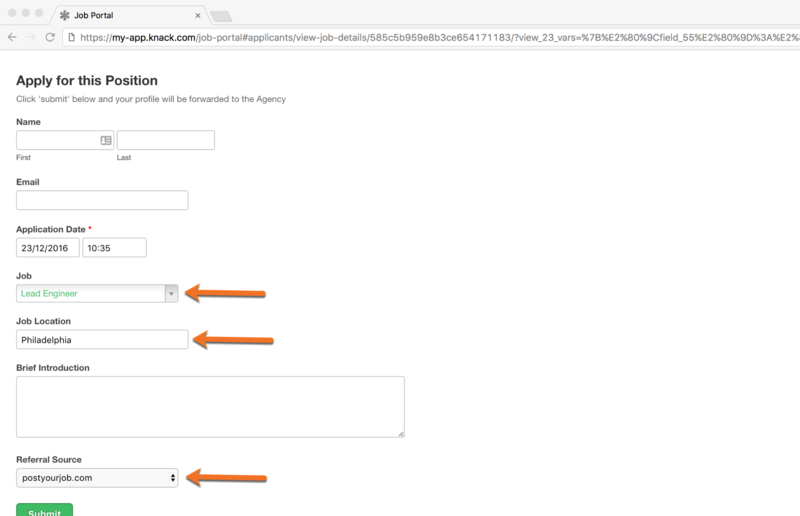 In this example, we want to pre-populate the Job, Job Location, and Referral Source fields with the values Lead Engineer, Philadelphia and postyourjob.com. If you're going to set a value for a connection field, it will work differently than with non-connection fields. You'll need to identify the specific connected value that you want to use for that connection field by its record ID. 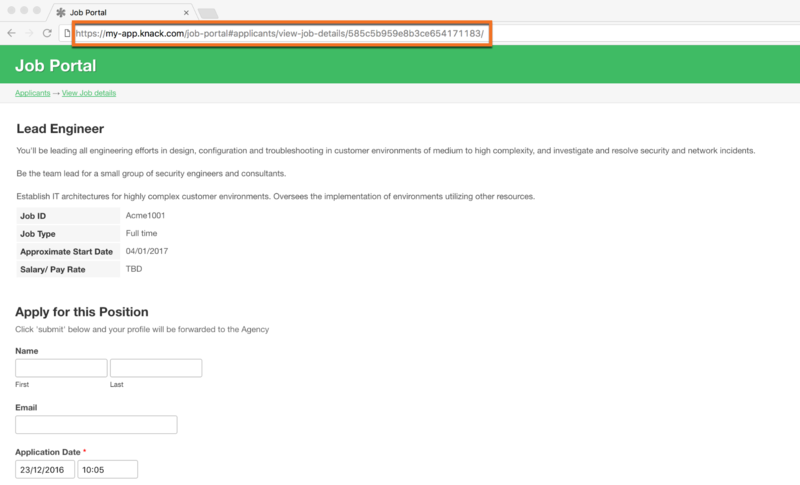 After using the browser inspector, we found that the record ID for the Lead Engineer record is 585c5b959e8b3ce654171183. So that's the value we'll use for the Job connection field in the next step. To see the format for all special fields, click here. Take the formatted fields and values from the previous step, and encode them using a tool like this URL Encoder. By encoding the fields and values you are ensuring that the links can be shared and used while retaining the correct values. *Be sure to replace [view_key] with the View key you identified in step one.